Revenues have climbed sharply for Jess Butler and Heather Free since their small businesses began sharing retail space on Front Street. “We find people buy anything we put in the window,” says Butler about her display of Red Balloon kitchen and patio wares. Butler and her mom, Sandy Butler, are local accountants who started Red Balloon about two years ago. It began as an online store selling kitchen and entertainment accessories with an upscale, novelty feel. A year later, the Butlers held a downtown pop-up shop that lasted three days and proved a big success. “We love meeting our customers and they like to see our product,” said Jess. Last Christmas, Red Balloon (rballoon.ca) leased temporary space at 172 Front St. and had another surge in sales. “I think we could have stayed online only but we noticed more sales when we got a storefront,” Jess said. So, when the landlady at 172 Front asked if the Butlers wanted to try another pop up for First Friday in August this year, they did. That confirmed for them that permanent downtown space worked best to attract new customers. But renting all of 172 Front was expensive and really more space than they needed. Jess started making cold calls and sending out cold emails, trying to find others who might want to share the overhead. She chose local craftspeople and makers who complement Red Balloon. “We never left after that First Friday,” she said. In a matter of months, Jess found several other business people to share the space and named the group River Bank & Co. In September, Heather Free moved her Mudd Puddle Soap Company (muddpuddlesoap.com) out of her home and into 172 Front. Her handmade lotions, soaps, body washes and beard balms have lots of room for display now and her sales have jumped. “I had been selling my products in my home and at shows,” she said. “But a storefront provides more access for people. Chef Paresh Thakkar has joined with a selection of hummus, soups-to-go, and frozen meals. He plans to introduce chutneys, sauces and dry soups, all made from scratch. 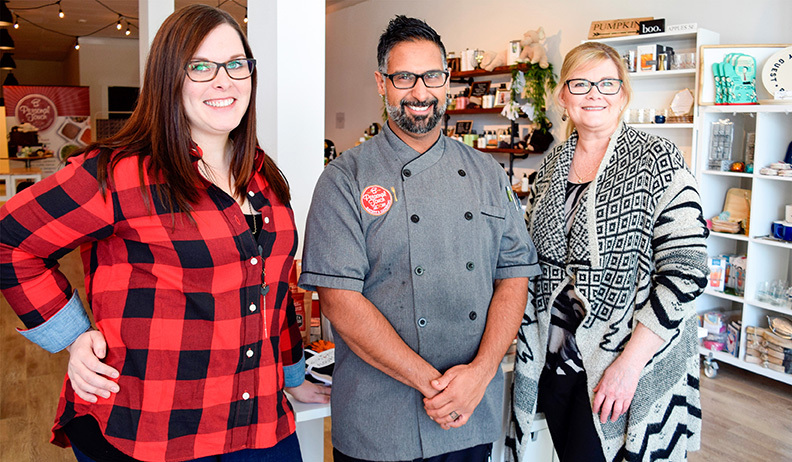 Thakkar already successfully operates Personal Touch Eatery & Catering on Mitton Street (personaltoucheatery.ca) and has no intention of closing there. But a Front Street presence expands his reach and introduces his product to a new customer base, he said. Wick & Bears soya candles, Loulou & Bee baby clothing and accessories, and fashion boutique Lace and Charm also sharing the space. Each business owner takes a turn staffing the shops one day a week. Jess Butler says there’s also room for hosting crafty workshops at the back of the store. And she is looking for a few more vendors interested in joining River Bank & Co. They can reach her at info@rballoon. The shops are open Tuesday – Saturday 10:30 a.m. to 5 p.m. Thursday and Friday hours are extended until 7 p.m.
On First Friday, Nov. 2, River Band & Co. will stay open until 9 p.m. and host live musician Jasper Blue (also known as Chris Bourke) on the guitar from 7 p.m. – 9 p.m.